Cowboys pass a the body of a horse that died after running full speed into the arena wall during a local "Ranch Rodeo" in Broadus, Mont. The spooked horse, unused to the crowds and frenzy of a rodeo, was so afriad it didn't see the wall. Its neck broke on impact. 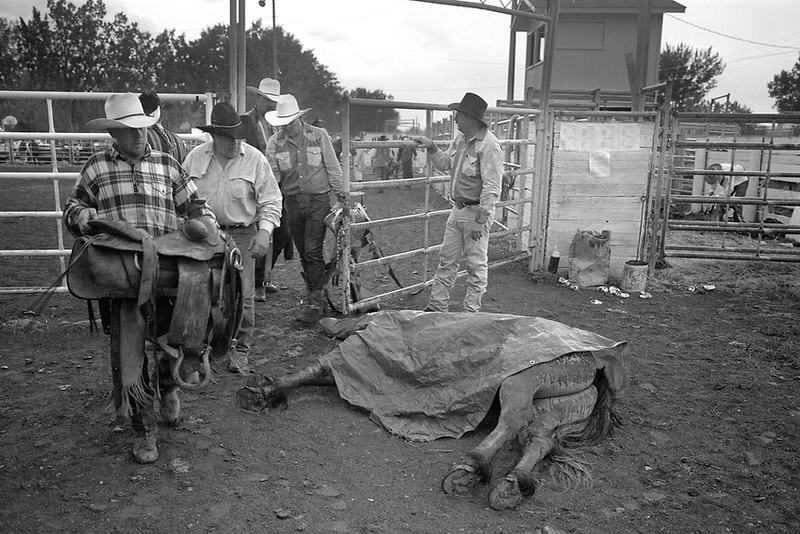 Such accidents with livestock are rare at most rodeos, where only trained rough stock are used. Professional rodeo livestock, say most cowboys, are simply doing the job for which they were trained. Ranch rodeos, by contrast, are events for amateur locals, using whatever livestock is available.